ROOT: The birth of Kim Jong Il in the days when the liberation of the country was dawning was a great event for the Korean people. The birth of Kim Jong Il in the days when the liberation of the country was dawning was a great event for the Korean people. 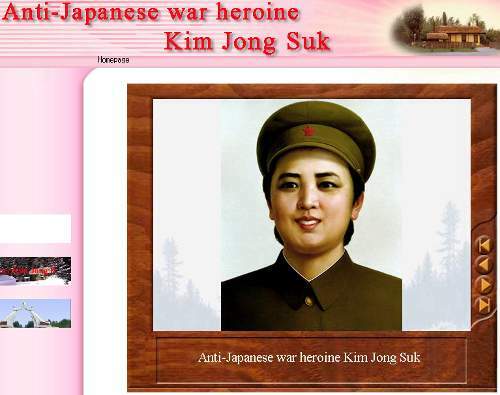 check out uriminzokkiri, a website run by the north korean government and start losing your mind. the lady above is kim jong il's mamma. "Kim Jong Il was unusual in his abilities of observing, discerning and analyzing things. In his young days, with sincere and careful observation, he learned why hens hold their beaks up after pecking at water and why there are no black flowers. One year, on the night of August 15 by the lunar calendar, he was watching the moon. Someone told him that according to a legend, on the moon there is a cinnamon tree under which a rabbit is pounding something in a mortar. Remembering that a plane seems to grow smaller as it flies higher, and eventually disappears, Kim Jong Il refuted the legend by saying that a rabbit on the far-way moon cannot be seen. His abilities of observing things and phenomena, and creative thinking were quite exceptional."